If you’ve had the chance to visit America’s big cities, you’ve no doubt noticed that almost without exception they’re pretty terrific places to be these days. The revival of America’s big city downtowns and neighborhoods, the development that’s occurring in the inner ring suburbs, all portend something very useful to the nation’s well being in this century. The prosperity that’s occurred in American cities represents one of the great achievements in the United States in the last decade. Today, the Brookings Institution’s Metropolitan Policy Program launches a multi-year initiative, the Blueprint for American Prosperity, that urges candidates in the 2008 presidential election to not only take note of how American cities secured their well-being, but also that the nation would do well to mimic those steps. Making places better involved protecting natural resources, investing in transit and other infrastructure, promoting housing, curbing sprawl, securing institutions like museums and universities, improving public safety, conserving open spaces. It also involved welcoming and providing opportunities for young entrepreneurs, and prompting civic excitement. “The assets that matter in today’s global and knowledge economy are innovation, infrastructure, human capital, and quality places,” according to the Blueprint’s developers. And what’s good for cities is great for the country. “The top 100 metros take up just 12 percent of our land mass but make up 74 percent of our college graduates, originate over 80 percent of all patenting, and therefore generate 75 percent of the nation’s GDP,” said Amy Liu, the deputy director of the Metropolitan Policy Program. The initiative’s launch marks the 10th-year of the Metropolitan Policy Program, one of the great idea laboratories in urban affairs. The director is Bruce Katz, a former Clinton Administration housing official and the winner of the Heinz Award for Public Policy. Whether presidential candidates take note of the Blueprint is far from certain. They should. Among the important helpings in the data feast that Mr. Katz’s crew fed to reporters today was this chart outlining how critical metropolitan health is to every state. In Michigan, for example, the Detroit, Grand Rapids, and Lansing metro regions account for 56.5 percent of the state’s population, 60 percent of all jobs in Michigan, and $247 billion in annual economic activity or 66 percent of state GDP. Even in Michigan, which has the highest unemployment and the largest state budget deficit, metropolitan regions are holding their own because they’ve developed and embraced a new development strategy. Health Hill in downtown Grand Rapids, which in the 1990s grew for the first time in 40 years, is the scene of $1 billion in new medical research, training, and patient facility construction, the largest such concentration of health-related construction in the United States. The Economist magazine last week reported on signs of revival in Flint and Saginaw. Ann Arbor, which also grew in the 1990s, is engaged in an intense civic conversation to establish a new rapid transit line that links the city with Detroit and to build new housing and offices downtown. The Traverse City region has undertaken a two-year, $1.3 million federally-financed transportation and land use study intended to draw up a multi-county plan for guiding development and building transportation infrastructure over the next generation. Several of Detroit’s inner ring suburbs – Ferndale, Royal Oak, Birmingham, to name three – have raised and invested resident taxpayer dollars in schools, central business districts, parks, housing, and transit to stabilize neighborhoods and attract new residents downtown. Similar far-reaching growth initiatives are occurring in nearly every other metropolitan region of the country. Last November, for instance, voters in Salt Lake County, Utah approved spending $45 million to protect open space. Residents in Salt Lake and neighboring Utah counties also raised the sales tax to add 23 miles to the 19-mile regional light rail system that opened eight years ago, and to double the length of a new commuter rail system set to open next year. When the construction is finished by 2015, the Salt Lake City region will have spent roughly $3.1 billion to build a 45-mile light rail system, and a 88-mile regional commuter rail network, the West’s second largest regional rapid transit system next to the 172-mile system that Denver is now building. In Salt Lake City itself, equally impressive projects have occurred. The city was one of the first in the nation to require municipal buildings to achieve the highest standards of energy efficiency. It allows owners of energy efficient low-emission cars to park for free. The city enacted zoning and permitting changes to encourage much more dense downtown neighborhoods, and to discourage strip malls. Salt Lake City also constructed a public library that is a showcase of technology and architecture, and is doing everything it can to support a downtown construction boom that is adding a light rail extension, millions of square feet of new energy efficient retail and office buildings, and more than 1,300 new homes. In Chicago, Mayor Richard M. Daley has instituted a wave of growth measures that fostered a cultural and economic revival unmatched by any city in the Midwest. The Daley administration has planted 500,000 trees, is putting up the most energy-efficient and environmentally sensitive municipal buildings in the country, has agreed to provide developers with much faster permits if they construct green buildings, and instituted a $600-million-a-year program to repair neighborhoods and city parks. The showcase of Mayor Daley’s program is Millennium Park, a 24.5-acre, $475 million expanse of lawn, wild-grass prairie, sculpture and gardens that joins the fast-growing neighborhoods along Michigan Avenue to Lake Michigan. The park is credited with prompting construction of more than 10,000 new units of downtown housing. Chicago’s transformation has been striking. Indeed, when the results of the 2000 census were published, the magnitude of what Chicago accomplished became clear. The city’s population increased by 112,000 people, the first time that happened since the 1940’s. Chicago’s downtown neighborhoods grew by 16,000 residents during the 1990’s, according to the Metropolitan Policy Program. The city’s median income increased 12.6 percent in the 1990’s, 2 percent higher than the median incomes of the state or the six-county metropolitan region. In the Pacific Northwest, Seattle (see pix) has developed new zoning provisions to reduce the vehicle population in an increasingly jammed downtown. Earlier this year, the city established an ordinance that requires its Transportation Department to give walking, biking and transit equal priority with cars and trucks before it improves existing streets. The directive is leading to more bike lanes, wider sidewalks and fewer car lanes, thus making room for rail lines and buses on some of Seattle’s major streets and boulevards.Seattle just completed a master plan intended to sharply increase the number of miles of bike lanes painted on city streets, or bike paths separated from traffic. A pedestrian master plan is in development. The city is also reworking its parking policies. Last year, Seattle eliminated a provision that required a minimum number of parking spaces for every 1,000 square feet of new construction. It is possible now for new buildings in several downtown districts to be constructed without any parking. And Seattle is developing alternatives for its residents and workers. A 2.6-mile, $49 million streetcar line that serves downtown opens in December 2007. A 15.6-mile, $2.3 billion light-rail line that links the city’s center with the Seattle-Tacoma International Airport is scheduled to start in 2009. Today, Puget Sound residents vote on a $10.8 billion transportation bond measure, more than half of which is devoted to improving public transit. 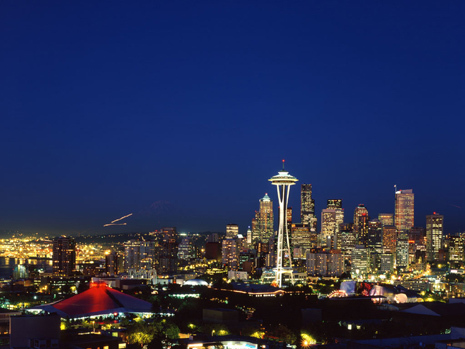 All of these initiatives have helped to make Seattle one of the most popular and prosperous cities in the world. Over the next 15 years, the city’s population is expected to grow to 680,000 by 2022, about 100,000 more than in 2004, and Seattle will generate 84,000 new jobs, 50,000 of them downtown. We absolutely love your blog and find many of your post’s to be just what I’m looking for. Would you offer guest writers to write content to suit your needs? I wouldn’t mind writing a post or elaborating on many of the subjects you write with regards to here. Again, awesome weblog!